I first discovered the work of Tanith Lee in the 80's when I came across her short fiction in INTERZONE. I was by then already interested in writing and the magazine represented everything I aspired to do. Tanith's stories stood out to me. They were emotive, evocative, the language she used was literary and incredibly intelligent. I had to learn more about her. Combing my local bookstore I found a copy of SABELLA OR THE BLOOD STONE, and after digesting this magnificent, science fiction vampire story, that was sensual and exciting, I soon found THE SILVER METAL LOVER. After that I was completely hooked on her work. Sadly at the time it was very difficult to find full sets of books in a series in bookstores and libraries and so the offering was sparse. Another of my favourites, however, was VIVIA and I also enjoyed BITING THE SUN. Some years later, when I'd had the audacity to write my own vampire novel, KILLING KISS, I met Tanith at a literary convention called EasterCon. This was in 2008. I had the luck to be placed on a panel with her. My daughter Linzi, who had already discovered her works in my paperback collections, had digested all that was on offer, and was a huge fan of her as well came with me to the convention: she was 15 at the time. After the panel, Tanith turned to me and said she would love to read my book as I'd mentioned it during the discussion. I nearly fell to the floor with a cry of 'I'm not worthy'. And I knew I wasn't. But I did give her a copy, expecting her to not really have time to read it, and thinking that she had only asked to be polite. However I spent a lot of time with her and her husband John Kaiine that weekend and we became great friends. By the end of the convention we had exchanged addresses and phone numbers and we were planning to keep in touch. A few months later, when a major life change happened and my first marriage came to an end, Tanith was a great confidante and friend to me. She and I enjoyed frequent long phone conversations, and consolidated a friendship that I felt was always going to be there. She also hugely surprised me with how very supportive she was about my writing. There was never any edge to her about other writers and their works. I even received a beautiful letter from her talking about the book I'd given her, telling me how much she liked it and she kindly gave me a quote to put on the cover too. Over the years I've met other writers, dealt with their significant insecurities, but Tanith never seemed to have those. She was lovely to everyone. Supportive, appreciative and very generous with her time and advice for new writers. I wish we could all take a leaf out of her book on that score. When we finally met again some years ago at World Horror Con in Brighton, I was thrilled with the way she greeted me and spent time with me. It seemed that whenever we met, or spoke on the phone, it didn't matter how much time had passed, it always felt as though we could pick up where we last left things. When I started working with Telos Publishing, and editing their Moonrise fiction imprint, of course I wanted to work with Tanith once everything was set up and running smoothly, I contacted her last year and asked if we might, in our very humble way, be able to republish THE SILVER METAL LOVER, or any other of her wonderful titles that she may have available. Tanith came back and gave us an impressive and comprehensive vampire story collection, containing several new, previously unpublished stories, which she wanted to call BLOOD 20. She also offered us a crime novel called DEATH OF THE DAY. Obviously we were delighted, and I was thrilled to be able to work with her on a professional level. She was a total delight professionally as well as personally. Always helpful, always hard working, and despite the illness that was already taking hold of her, working to deadline. 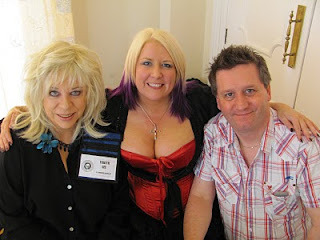 We arranged that she would launch BLOOD 20 at EasterCon (Dyprosium) in 2015 and we planned to catch up properly there. I was looking forward to seeing her again more than I can say. Unfortunately when the time came, Tanith, sadly, was not well enough to attend. David and I were, however, delighted to see Tanith's husband, John, who came along to represent her at the event. We'd known for some time that Tanith was seriously ill, but I had kept hoping for some miracle that would save her in the eleventh hour and keep her amazing talent longer in this world. John has been a rock throughout, and despite the pain he was feeling, managed to remain energetic and entertaining at the convention. So when he emailed me yesterday morning to explain that Tanith had passed away and was no longer in pain: there was both an outpouring of sorrow tinged with a bitter happiness that her suffering was over. Over the last 24 hours I've seen the signs of her unique influence on the industry and the people within it as news of her death has spread, and the people who she touched have been telling their own stories of her kindness and brilliant talent. Some people come into your life for very special reasons. I know that Tanith Lee touched many lives, and that she brought them, through her literature (and for those who were fortunate to meet her and know her, however briefly in a personal way) a great deal of joy. I was very lucky to be one of those people. I am in mourning for my friend. For one of the most unique, talented and impressive wordsmiths I have ever read. And for the loss of one of the great artisans of fantasy and science fiction. This price link covers a hardcopy of the EP and Postage and Packing to the UK only. For all other countries ... we are offering to email the MP3 versions of all tracks to your designated email address. ALL PROCEEDS FROM SALES OF THE EP WILL GO TOWARDS HELPING LINZI MAKE HER FULL ALBUM. The EP, STORYTELLER, is now finished and we are currently working our way through making up all the perks to complete the first campaign. This has sadly been delayed due to a serious health issue as my fiance, David, had a major heart attack a couple of weeks ago. David is now recovering well, but it did mean that the planned video shoot had to be put back until July. And also, that some of the preparation of perks, that he was using his skills to do have also had to be halted while he recovers. So far we have copies of the EP, Photographs from the photo shoot, and the prepped artwork of SILVER. Meanwhile Linzi is completing the artwork for the Lyrics booklet while she prepares for the video shoot. 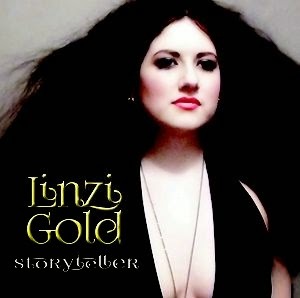 We have however decided that it would be best to move on with Linzi's Album in the interim, so that the momentum of the Glass/Gold writing partnership is not lost. This means that we have had to launch another campaign in the hope of raising some further funds towards the cost of the album. Lots of people gave very generously last time and we are hoping that those who can't donate will at least help by spreading the news about the campaign and about Linzi's music. So donate if you can, but if you can't - then please spread the word. All plays on YouTube help to raise Linzi's profile. Click the link below to see the campaign details. Thanks so much for your continued help and support! !